Kimi Raikkonen won the 2012 Abu Dhabi Grand Prix on Sunday, his first victory this year and since his comeback which makes the championship even more interesting and intense with two races left. The 2007 world champion overtook Red Bull’s Mark Webber at the start to stay firm in second. He took the race lead on the 20th lap when McLaren’s Lewis Hamilton retired because of a fuel pressure problem. The Finn then held off Ferrari’s Fernando Alonso, who finished second. Two-time defending F1 champion Sebastian Vettel clawedfought his way back from the pitlane (start, penalized due to fuel irregularities in qualifying) to finish third, resulting in lead over Alonso cut to 10 points. Sebastian Vettel leads the drivers’ championship with 255 points, followed by Fernando Alonso at 245 and Kimi Raikkonen at 198. Alonso, who struggled for pace across the weekend, said he is thrilled to have repeated his second-place finish from the Indian GP after also starting down the grid in that race. Vettel said he always believed he would end up on the podium. The race featured at least a half-dozen crashes — the most dramatic when Nico Rosberg ran into HRT’s Narain Karthikeyan, flew over his car and crashed into a wall — and resulted in two safety cars being sent out on the track. Starting from the pitlane, Vettel was in the middle of many of the mishaps early on in the race. Moving quickly through the pack, he clipped Williams driver Bruno Senna and had to visit the pits for a new front wing. He then went off the track to pass Romain Grosjean and collided with Felipe Massa, causing the Ferrari driver’s car to spin. Despite all the mayhem, he moved up to fourth and then overtook Jenson Button with three laps remaining. Lewis Hamilton’s earlier departure ended his bid for a second title as it did for Vettel’s teammate, Mark Webber, who pitted at one point to allow the German to move ahead of him into fourth. The Australian’s race ended in the 39th lap when he collided with Lotus Romain Grosjean, who stalled after crashing into Sauber’s Sergio Perez. Through it all, the Iceman appeared to remain above the fray. In fact, he repeatedly chided team officials on the radio when they offered him advice. At one point, he responded “leave me alone” when told of how far he was ahead. Nico Hulkenberg (Ger) Force India 0 Laps completed . 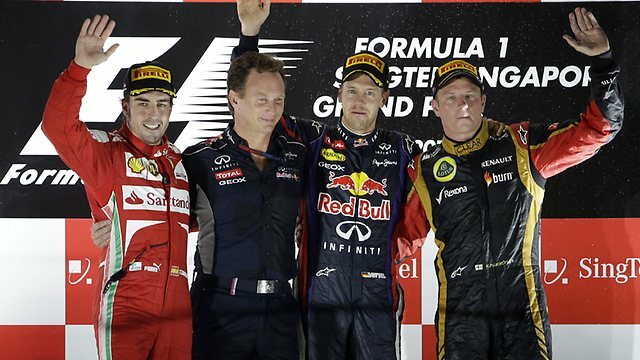 Many fans will agree that it was the best Abu Dhabi GP among the four held so far which was action packed. Next up will be the Grand Prix of America which will be held at a new venue Austin, Texas at the Circuit of The Americas which is very similar to the Buddh International Circuit at India in ten days time. Red Bull’s Sebastian Vettel has been disqualified from qualifying at the Abu Dhabi Grand Prix and will start from the back of the field. The world championship leader, who had qualified third, did not have enough fuel in his car for a fuel sample to be taken. Vettel stopped his car out on the track on his way back to the pits at the end of the session, as had happened to McLaren’s Lewis Hamilton in Spain in May. It promotes his title rival Fernando Alonso of Ferrari to sixth on the grid. Vettel heads into the race with a 13-point lead over the Spaniard after winning the last four races. The F1 rules require the car to return to the pits with at least one litre of fuel on board – running less fuel gives a performance advantage. Red Bull have withdrawn their car from parc ferme to investigate further. Lewis Hamilton was fastest in FP1 with a 1:43:285s and second was his teammate Jenson Button +0.333 seconds behind. Red Bull’s Sebastian Vettel was third fastest with a lap time of 1:44.050s. Webber was fifth (+1,257), Schumacher sixth (+1.409), Maldonado seventh (+2.170),Rosberg eighth (+2.091), Bottas ninth (+2.062) and Raikkönnen tenth (+2.137). Maldonado (7th/+2.170) was faster than his Teammate Bottas(9th/+2.062) who drive for Williams. Timo Glock was on Kovalainen’s tail with 1:47.891s for Marussia, as Pedro de la Rosa took 22nd for HRT with 1: 48.354s. Max Chilton’s first Friday run for Marussia yielded a solid 1:48.887s, while Ma Qing Hua’s return to the second HRT, in place of Narain Karthikeyan, was good for 1m 50.487s. The session was fairly uneventful in terms of errors, with just Giedo van der Garde suffering an engine failure which stopped him from completing a single timed lap. 1-22012abu dhabi gpCaterhamFernando AlonsoGiedo van der GardeJenson ButtonLewis HamiltonMaldonadoMcLaren.